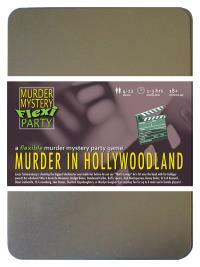 You've been invited to play the role of BUFFY SPEARS in Murder in Hollywoodland. You're invited to a star-studded yacht party, as Lucas Cameronburg is shooting the biggest blockbuster ever made! But before he can say "That's a wrap! ", he's hit over the head with his Goldguy award and pushed overboard! Join us to find out who cut Cameronburg from his own film! You never know when you’ll be called on to dust vamps so you dress for speed in a tight-fitting top, slim jeans, and stylish-yet-affordable boots. You wear your hair in a ponytail, a cross around your neck and never go anywhere without a stake. You always dreamed of being an actress but as a young girl from the Welsh valleys called Biffy, you felt your heritage was holding you back. So you set sail for Sunnyvale in the U.S. of A. and landed a plum role as a vampire-slaying heroine. Unfortunately, you became such an insatiable ego-maniac on set that when the series closed you found it difficult to find work, so tried to re-invent yourself with a music career. It half worked, but only half, so nowadays you turn up to most gigs with a stake and a mic, just in case people want one more than the other. Hi guys! I’m Buffy Spears and I’m a rocking hot vamp eraser who stakes and sings! Don’t believe the hype? Just google me! Anyhoo, Cameronburg wanted me in his film because, please, who wouldn’t? And if you see any vamps around let me know. I’ve got a pointy stick and I’m not afraid to use it. And if anyone comes across a Catholic schoolgirl uniform, it’s mine and I want it back. And Beeyanna Knowless is a bee hatch that can’t sing and won’t ever get my role.